It's a tad disheartening to be zooming down an interstate in Massachusetts in November and seeing a flashing sign from the local highway department seeking snowplow drivers. Such signs have been blinking for weeks now, asking anyone interested to call the Massachusetts Highway Department and maybe get a contract. "I don't get the Massachusetts system," wrote a member of the New England transportation newsgroup . "In other snowy states, the same highway department crews . . . who do road maintenance work in the spring, summer, and fall also do snowplowing in the winter. . . . Other than the standard answer of political patronage, what's the rationale for the Massachusetts system?" Jon Carlisle, spokesman for the Massachusetts Highway Department, said the department has long used hired equipment. Ninety percent of snowplow drivers are private contractors, he said. While the approach may change as the state tries to merge the highway department with the Turnpike Authority, it's thus far the best way to do business, he said. Carlisle said the state currently has more contractors signed up this year than at this time last year, "so we're comfortable." They even saved money with the highway message signs, which were used in lieu of radio ads. We went to the website of the Massachusetts Snow & Ice Contractors Association and found out the reason why the state may be so comfortable. If contractors signed with the state before Nov. 1, there was a $2-per-hour signup bonus. And then there's the new contract, which according to the Web page, includes paid travel and prep time, a fuel surcharge, paid break time, and relaxed insurance requirements. 'I am puzzled why the newly widened and improved Route 3 north of Route 128 has been saddled with a 55 mph speed limit, rather than 65," wrote Allen of Woburn. "To this layman's eye, the road's design is better designed than parts of I-93 and I-95 north, both of which are posted for 65 mph. The cynic in me can't help wondering if it has anything to do with providing a good hunting ground for speed patrols." Carlisle said it's a conundrum. The Highway Department is in talks with State Police to determine the appropriate speed for the roadway. But the two sides, we're told, are thus far split. "Our engineering seems to indicate that 65 is the appropriate speed," Carlisle said, "but obviously we want the concurrence of law enforcement before we make that change." That change could come sometime soon, he said. For those who like taking the Silver Line to Logan International Airport, a bonus. 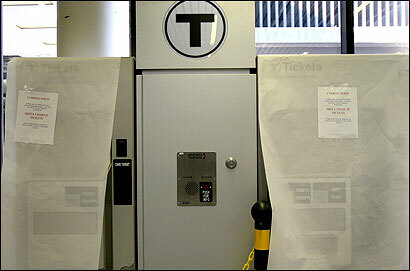 Just before the Thanksgiving rush, the T is installing fare vending machines at every terminal at the airport, not only allowing veterans, but visitors easy access to the bus rapid transit line. At the same time, the T announced last week that the long-anticipated CharlieCard -- the least expensive way to ride the T as of Jan. 1 -- will debut Dec. 4. The free cards will be available at a number of retail outlets, including convenience stores, Johnnie's Foodmasters, Shaw's Supermarkets, Super Stop & Shops, and Star Markets. They will also be distributed at key stations during rush hours. The Blue Line will be shuttling passengers on buses between the Airport and Government stations this weekend and next to allow renovations to continue at State Street station. During these diversions today and next Saturday and Sunday , the Government Center, State, Aquarium, and Maverick stations will be closed. The T is predicting 15- to 20-minute delays . Can't get there . . .
Interstate 93 south around Sullivan Square will be closed from 11:30 p.m. to 5 a.m. Thursday through Saturday morning. The southbound HOV lane and the Mystic Avenue onramp will also be closed. I-93 south around South Station will be closed from 11:30 p.m. to 5 a.m. Tuesday through Thursday morning. Three lanes of I-93 south approaching and through downtown will be closed from 11:30 p.m. to 5 a.m. Monday through Saturday morning. The Storrow Drive onramp to I-93 south will be closed from 11:30 p.m. to 5 a.m. Monday through Thursday morning. Exit 20B (Pike west/Albany Street) off I-93 south will be closed from 11:30 p.m. to 5 a.m. Thursday through Saturday morning. The ramps from the Tobin Bridge and Rutherford Avenue/City Square to I-93 south and Storrow Drive will be closed from 11 p.m. to 5 a.m. Thursday through Saturday morning. Exit 23 (Purchase Street) off I-93 south will be closed from 11:30 p.m. to 5 a.m. Monday, Thursday, and Friday nights. Two lanes of I-93 north through downtown and Charlestown will be closed from 11:30 p.m. to 5 a.m. Monday through Saturday morning. Exit 26 (Storrow Drive) off I-93 north will be closed from 11 p.m. to 5 a.m. Monday through Saturday morning. The Essex Street onramp to I-93 north will be closed from 11 p.m. to 5 a.m. Monday through Wednesday morning. The Atlantic Avenue onramp to I-93 north will be closed from 10 p.m. Tuesday to 5 a.m. Wednesday. The underpass from Storrow Drive east to I-93 north and the Tobin Bridge will be closed from 11 p.m. to 5 a.m. Monday through Wednesday morning. The single lane of the eastbound I-90 connector leading to the Ted Williams Tunnel will be closed from 8 p.m. to 5 a.m. Monday and Thursday nights and from 8 p.m. to 7 a.m. Friday through Sunday morning. A lane in the Ted Williams Tunnel eastbound will be closed from 9 p.m. Tuesday to 6 a.m. Wednesday. The Pike west near Logan Airport will be closed from 9 p.m. Monday to 6 a.m. Tuesday. The single0lane closure of the Pike west around Logan Airport has been extended through Nov. 18. A lane in the Ted Williams Tunnel westbound will be closed from 9 p.m. Monday to 6 a.m. Tuesday. The Sumner Tunnel onramp to Storrow Drive will be closed from 11:59 p.m. to 5 a.m. Monday through Saturday morning. The Congress Street onramp to I-93 south and the Pike west will be closed from 11:30 p.m. to 5 a.m. Tuesday through Saturday morning. Route 1A north near Logan Airport will be closed from 9:30 a.m. to 2:30 p.m. Monday through Friday. Complain to starts@globe.com. Don't forget your hometown. The column can be found at boston.com/starts with daily updates on the Starts & Stops Blog at boston.com/starts/blog. Our mailing address is Starts & Stops, P.O. Box 55819, Boston, MA 02205-5819.